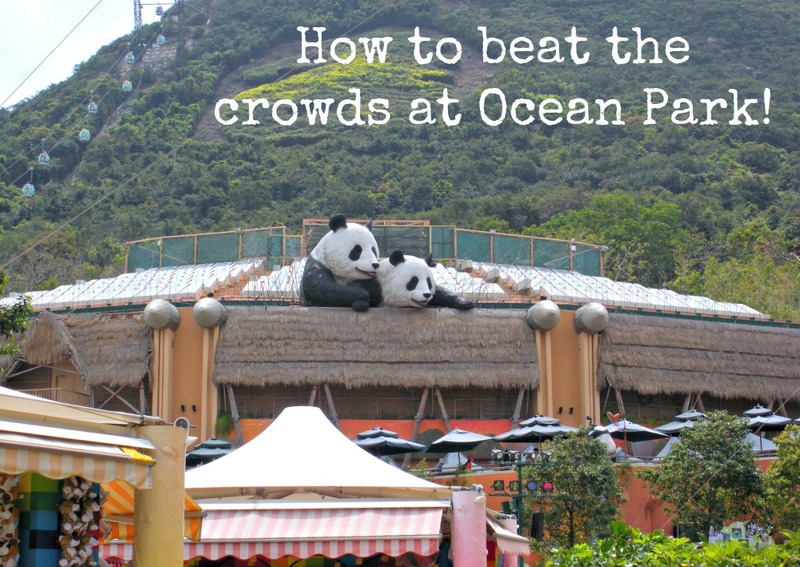 The ultimate guide to beating the crowds at Ocean Park! 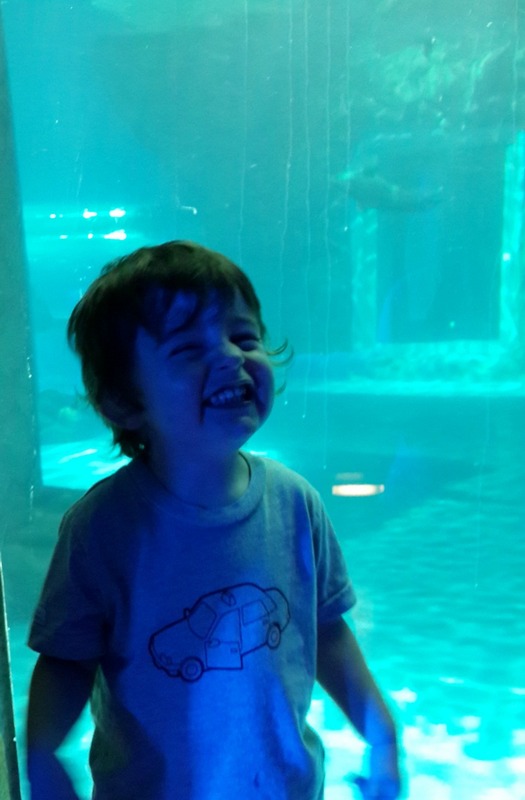 Whether – like me – you’re a Disney-phobe or just fancy a day out with the smalls that involves cute aquatic creatures and fluffy mammals without having to get on a plane to Borneo, then Ocean Park is the place for you. 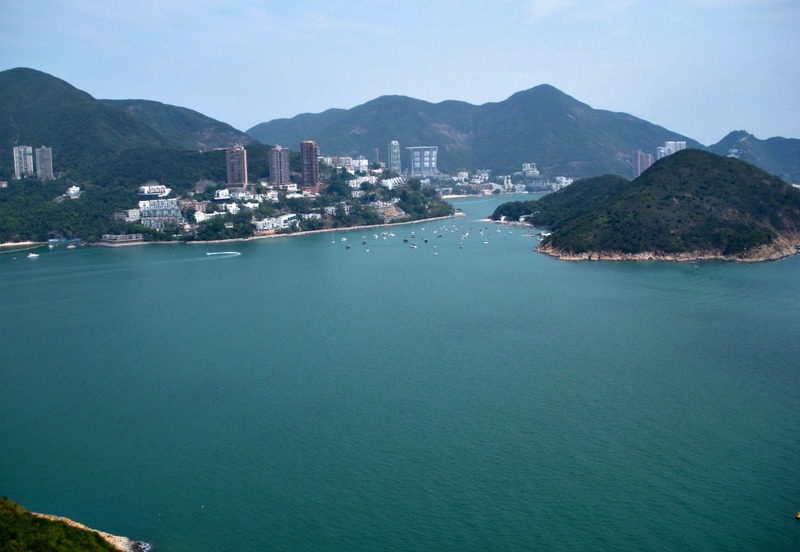 This home-grown Hong Kong theme park is loved by young and old and locals and tourists alike, and ticks a whole load of convenience boxes by virtue of its location on the Southside of Hong Kong Island. The downside? The place is so popular that the sheer volume of people can be overwhelming, particularly if you’re visiting with younger kids. The claustrophobic crowds and seemingly endless queues for rides and refreshments can make the whole venture seem like more hassle than it’s worth. A little advance planning will make your visit much more enjoyable. Pick your day carefully; as we already discussed, weekends are always busier, but Saturday is usually a bit quieter than Sunday. And this is pretty self-explanatory, but unless you have a fetish for being crushed up against thousands of people (and if you do, there are plenty of more *ahem* specialist blogs that you’d probably prefer), avoid public holidays like the plague – especially those that we share with our neighbours to the north. Keep time spent in queues with antsy children to a minimum by buying your tickets in advance. You can either buy online via the Ocean Park website or – and this is a really sneaky hack – in person at any 7/Eleven store. If you have a tame travel agent to hand, you can also ask them to hook you up with your tickets as they can often wrangle discounted admission. If you’re visiting with small children, it pays to avoid tears by researching the rides that they can go on before you arrive. There actually aren’t very many that are suitable for really little ones (below 1.2m) with the exception of some pretty meh stuff at Whisker’s Harbour. But never fear: animals are the star attraction here, so even if your small fry are too titchy to ride the rollercoasters, you’ll still find lots to entertain them. Hong Kong is not, in general, a city packed with early risers. Use this to your advantage by getting to the gates just as they open – this is 10am at the weekend and 10.30am during the week. Plan to arrive on time – earlier if you don’t have your tickets in advance – and grab a map on your way in if you aren’t familiar with the park. Once you’re inside the park, head directly to The Summit via the Ocean Express underground train. Most people head straight to the aquarium and the giant panda exhibition as these are the nearest attractions to the entrance, but you’re an individual… a maverick… a renegade theme park hacker! So don’t follow the crowd – by heading straight up you’ll have the place to yourselves for a couple of hours. Now’s the time to hit the rides. The train stop is right next to the Thrill Mountain and Rainforest areas where there’s plenty to do before moving on to your next stop, Adventure Land. Leave Marine World until last (except the Ocean Theatre – more on this in a moment), before you head back down the mountain. It’s highly unlikely that you’ll have to queue up for anything until about midday, so make the most of the quieter morning and hit up as many rides as you fancy now. Your next stop is the South Pole Spectacular… which is a fancy way of saying penguins. It is worth noting that this bit doesn’t fully open first thing, but that this can work to your advantage as you can still go inside earlier, and – although the lights are kept dimmed until 11am – the keepers will usually be in there refreshing the ice and feeding the penguins, making it the perfect time to go with little ones as they’ll be able to get right to the front and say hello to Pingu without being squashed. Next door is the North Pole Encounter which rarely sees the same crush for reasons unknown. This is home to Ocean Park’s seals, sea lions and walruses, all housed in a multi-tiered enclosure that Master T-T absolutely loves. 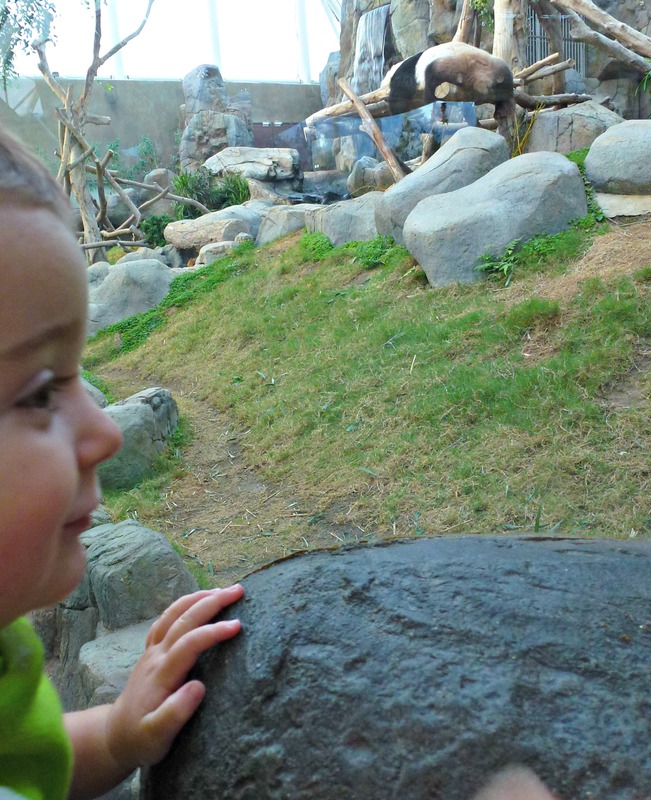 Don’t forget to check out the Arctic Fox Den on your way back out – this is a small space just off the gift shop. It’s all change at around 12.30 – 1pm once the big coach tour groups start arriving. As being in exceedingly close quarters with hoards of people in identical hats is precisely nobody’s idea of a good time, you should probably consider a lunchtime pit stop followed by exploration of some of the less popular corners of the park at this point. A good place to eat your contraband sandwiches is the Garden of Joy, a fairly peaceful manicured Japanese garden with a few seats where you can catch your breath before the next onslaught of theme park fun. Further away from the Ocean Express station is Marine World, which should be your last stop before you head back down the mountain. Even at 2pm it’s still quieter than most of the other areas with some fun rides there to enjoy along with two excellent animal exhibitions there that are always practically empty at any time of the day whenever we’ve visited. 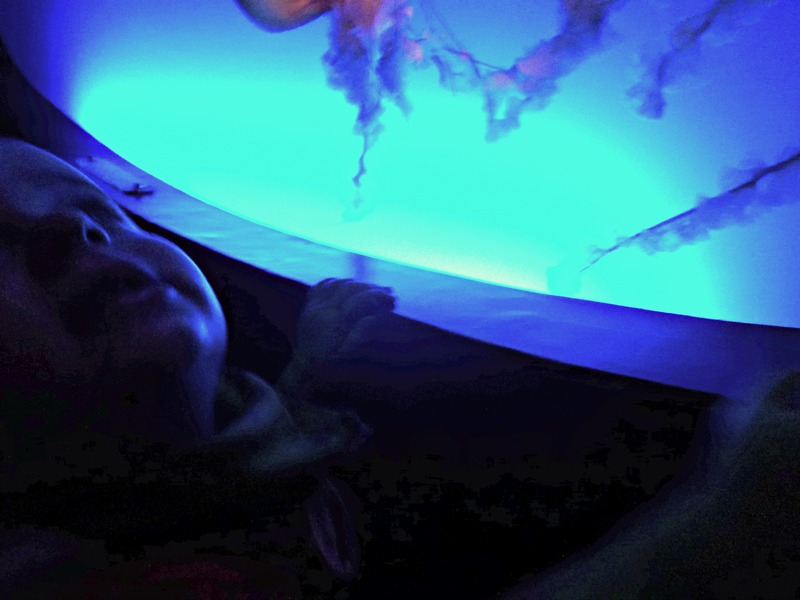 Sea Jelly Spectacular contains thousands of jellyfish set against multicoloured lights. It’s fascinating to look at – kind of like a living lava lamp – and really popular with little kids. Shark Mystique is dedicated to the top of the aquatic food chain and is probably the best attraction in terms of education, as the conservation message is central to the exhibit here, as opposed to feeling tacked on at the end as it can elsewhere. This is a great opportunity to learn about sharks as well as seeing them close up. 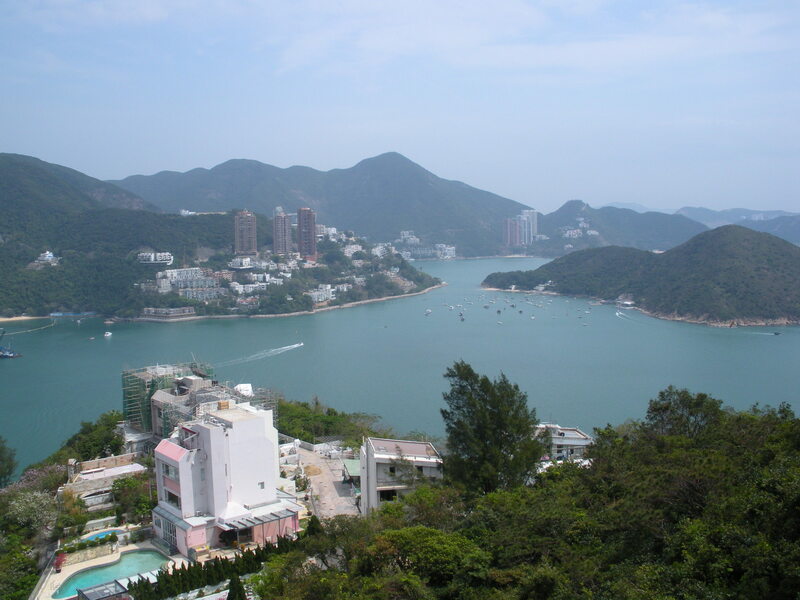 Once you are finished with the Summit, it’s time to take a ride on the spectacular cable car back downhill. As long as you head down before 2pm there should be little to no queueing to get on, although during busier periods you may have to share a car. Get the best view by making sure that near the end of the queue when the path splits in two, you keep right. This ensures you get a car on the outside line for a clear, unobstructed view over Repulse Bay and beyond (on a clean air day, natch). Once you’re back down at the Waterfront, head right through the kitsch Old Hong Kong and make for the famous giant pandas. 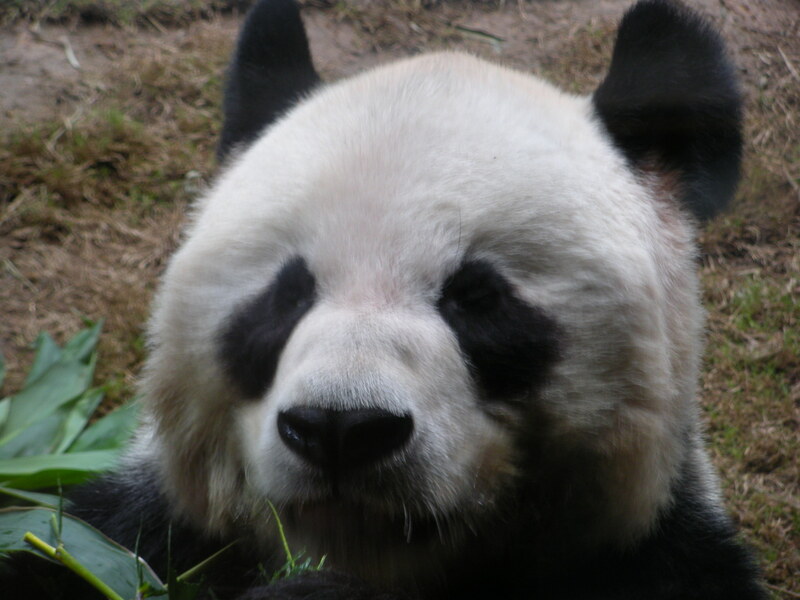 There are two panda exhibitions; ignore the more obvious Sichuan Treasures (you can’t miss it – it has huge fibreglass pandas on top) and instead opt for the Giant Panda Adventure. Not only is this a much more open and less crowded setting in which to view these gorgeous creatures, it’s also home to some ridiculously cute red pandas too. Next door is the Amazing Bird Theatre, which often gets missed off the itinerary in favour of the showier pandas and dolphins. It’s definitely worth a visit and, although the show is in Cantonese only, the theatre is very small and Master T-T LOVES watching the colourful birds fly close overhead. 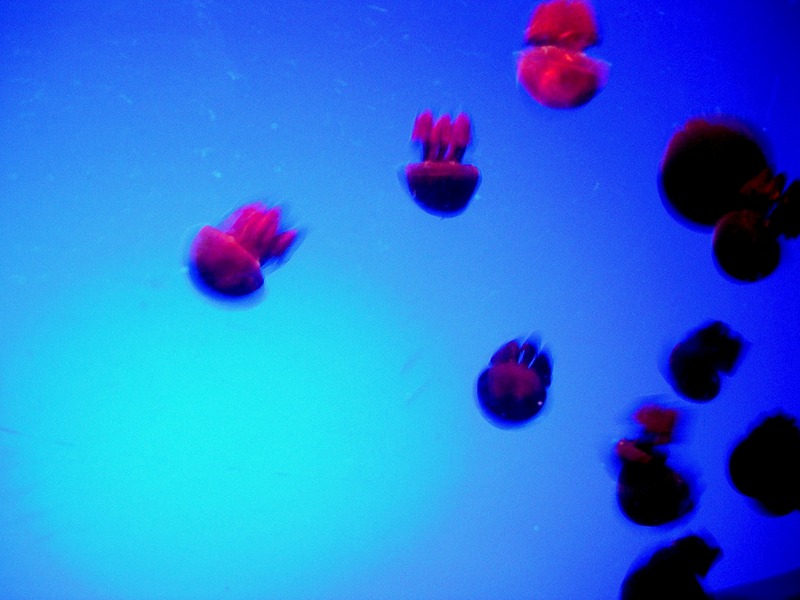 Finally, the last stop on your tour should be the aquarium, which for us is usually the highlight of our visit. While it’s never empty, it’s definitely always quieter later in the day so you should be able to get a decent view of all the wonderful marine life on display. Having paid large sums of money to see far less impressive aquariums, the fact that this one is included in your ticket price makes it a must-view. And there you have it. Ocean Park, done like a pro. Collect your “Parent of the Year” medal at the gate and leave before 4pm to beat the crazy crush for the bus and taxi queues. Now head home in a leisurely fashion for a richly deserved cup of tea/G&T/Valium. You’ve earned it. This post is very helpful in our planning. 🙂 I literally followed everything. Hehe! We will visit Ocean Park this coming March. Thanks! Thanks for reading and I’m glad it’s helpful! We actually don’t have a Disney one as my son is about the only four-year-old in the world who doesn’t like Disney — so strange! I haven’t seen a Disney guide but I’ll bet someone out there has done one — good luck! 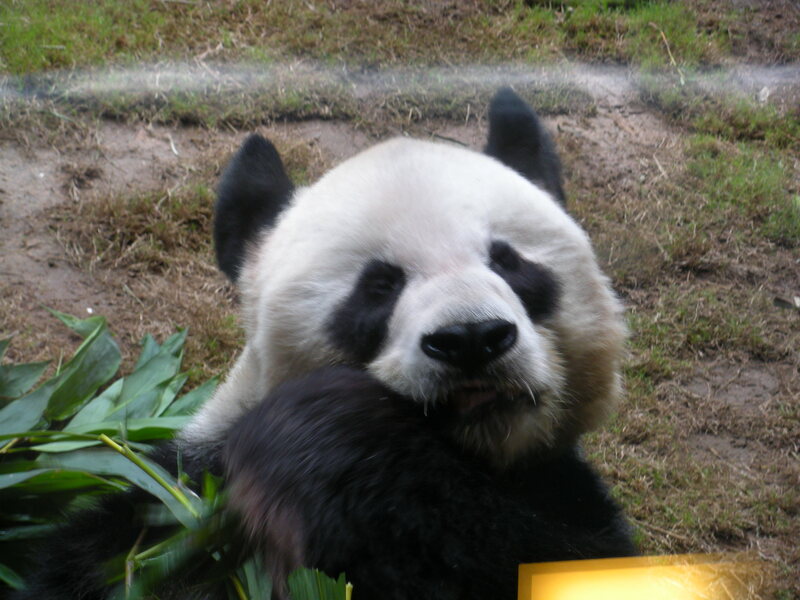 So glad you found my guide to Ocean Park helpful – looks like you had a great day! Will try to follow this. We only have a half day free tomorrow – from 12 to 630. I don’t know if there is enough time for us to go around ocean park. THanks for the tips!!! Half a day should be just about right if you arrive early enough (and depending on your kids’ ages/tolerance levels!). Enjoy your visit! thank you so much for the tips! these are very helpful! Thanks a lot for this awesome guide! I went to the Ocean Park on Friday, 26th May 2017 with my wife & 2 kids. We followed these tips. There were a few hitches though (we entered the park at 10 am, but the Thrill Mountain & Rainforest weren’t open until 11:00) so we had to change course a bit. Nevertheless, we did manage to beat the crowds and avoid long queues at most rides. So glad it was helpful and thanks for your feedback!